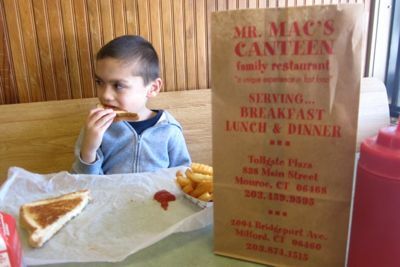 “We deep fry our hotdogs and then roll them on the grill, crisp, and put them on a fresh toasted, grilled roll,” says Jeffrey McFadden, co-owner of Mr. Mac’s Canteen. And so, as I near the end of this epic multi-year Roadfood hotdog battle/journey, I figured hey, what’s another “deep-fried in oil hotdog or two?” And oh, why don’t you fine Mr. Mac folks dump on a bunch of your famous hot chili while we’re at it? Thanks. At the time of this writing, I believe I have only ONE more hotdog to eat from this list – a list of 16 hotdogs from around the state. (Three places closed before I could get to them). 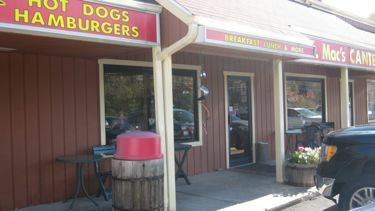 Monroe has two – TWO – hotdogs on the Roadfood list. TWO! Monroe is not an easy town to get to either, no matter where you’re coming from. But I planned a morning of hiking with Damian, followed by lunch at this place and then some other stuff later. The drive down route 25 from Newtown’s center is only about 8 minutes. Anyway, Mr. Mac’s is in an ugly strip mall on route 25. It has a very unexciting storefront. One inside, it is distinctly bare bones. The most prominent signage around the restaurant note that this is a CASH ONLY establishment. I was waited on immediately. Staffed by what looked like a bunch of 18-22 year olds who may or may not be pursuing college degrees, I was impressed with the general friendliness and promptness of the crew. Though dude, when you have to have a cigarette, try not to do it, like, right in front of the door. Just step away maybe 10 feet down or something. I mean, this is just a fast food greasy spoon, so I don’t care that the sandwich makers smoke, but… you know what I’m saying. 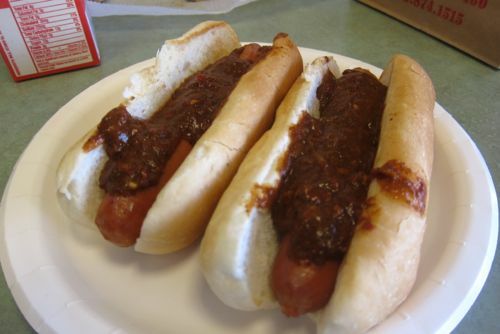 As per Roadfood’s list (from the book), I ordered up two chili dogs, which author Michael Stern notes are “fire-breathing”. 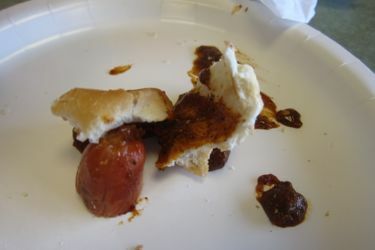 Place your order for a dog, a cheese dog, or a chili dog, and as soon as the natural-casing frank is pulled up out of the hot oil and rolled around on the grill to get a crisp crust, it is bunned and placed in a cradle for the final dressing with your choice of mustard, relish, onions, bacon bits, or sauerkraut. It is then wrapped and/or put on a paper plate. 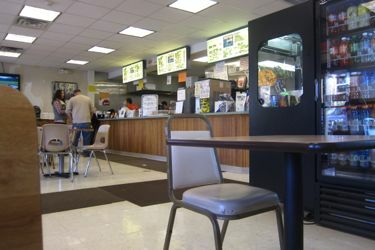 Customers carry their own to a table in the spacious dining room. The hot dogs are first rate; Mr. Mac’s chili topping puts them over the top. The folks behind the counter usually warn first-timers who order chili dogs that Mr. Mac’s chili is very, very hot; and indeed it is. Unlike typical chili-dog toppings or Coney sauce, this stuff is as dark as a good mole, and every bit as thick and complicated. At first, it tastes sweet, seductively so. In moments, the sweetness yields to blossoming heat and pretty soon your tongue is on fire, in the best possible way. 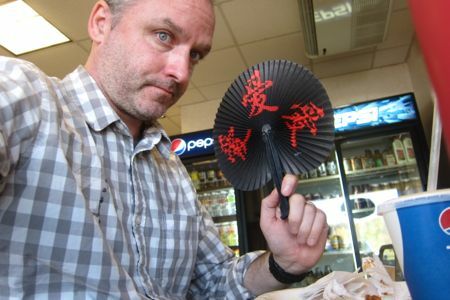 But check this out – Damian’s kid’s meal came with this fan. How convenient. After a few bites of the chili dogs, yeah, it was hot. Pleasingly hot. And it was pretty delicious. I still have to give it up to Capital Grill in New Britain for their mystery saucy topping, but Mr. Mac’s is pretty darn good. Spicy sweet and of indeterminate origin, I endorse the Mr. Mac chili. The hotdogs themselves had that snappy crunch from the oil bath and quick turn on the grill. The buns were toasted enough to stand up to the chili sauce. And at only $2.40 each, I completely agree with these dogs being on the Roadfood list. 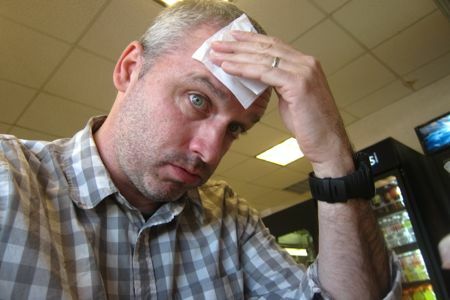 These pictures of myself were attempts to show chili-induced sweat on my forehead. Ok, that’s enough about a hotdog in Monroe.